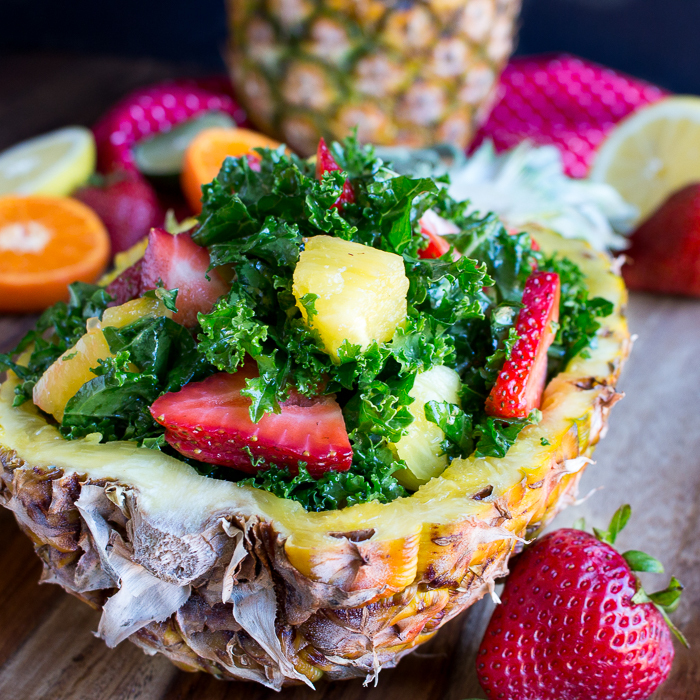 Tutti Fruitti Kale Salad and Citrus Honey Dressing is a zesty kale salad with plump strawberries, organic pineapples drizzled with a delightful citrus honey dressing. 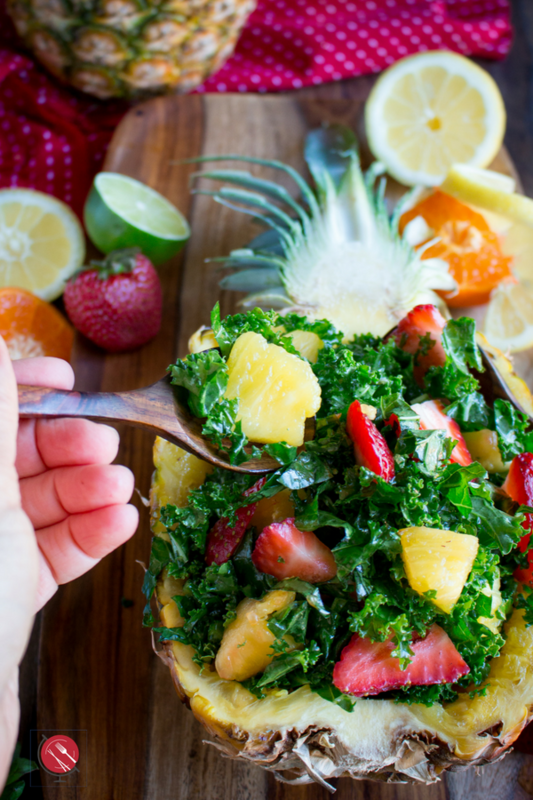 Tutti Fruitti Kale Salad with Citrus Honey Dressing is so delicious as it is half a fruit salad and half healthy kale salad. 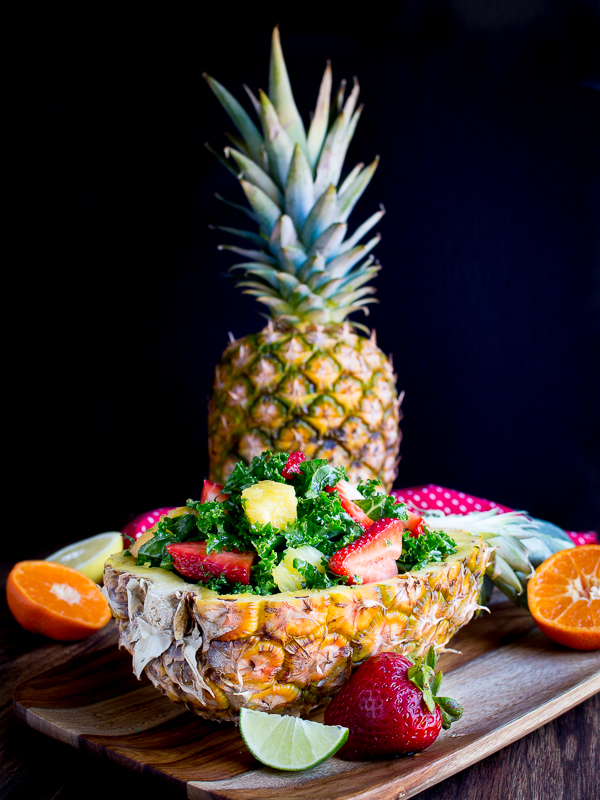 Sweet plump strawberries and pineapples were bountiful at the markets but feel free to exchange with any fruits in season that you desire. . Tutti Fruitti Salad and Citrus Honey Dressing is gluten-free, lactose free and vegan. Bikini season and swim trunk season is well on its way. 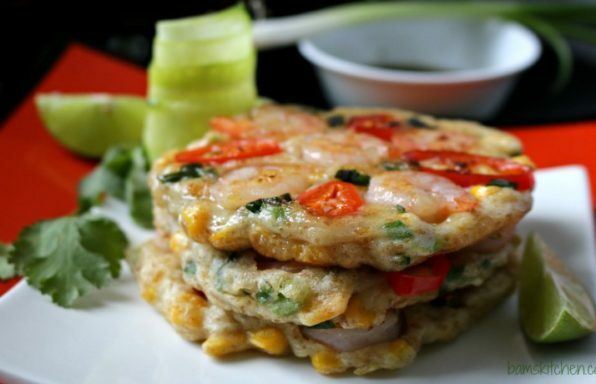 You need some quick and easy refreshing recipes to make at home and bring with you to BBQ's and events that can keep you looking fit. Tutti Fruitti Kale Salad and Citrus Honey Dressing is one of those 15 minutes wonders you can prep ahead and then toss in the dressing just before serving. You gotta love that! We did not even want to bother needing to wash a dish or worry about getting a dish back at a party so we served the Tutti Fruitti Kale Salad and Citrus Honey Dressing right inside the pineapple boats. Super Cute, right? Healthy World Cuisine first posted Tutti Fruitti Kale Salad and Citrus Honey Dressing on April 11, 2014 when we formally known as Bam's Kitchen. However, the photos and post was in a need of a little face lift so reposting today for you. We know what you are thinking kale, really? However, trust us on this as it is superb with fresh fruits. 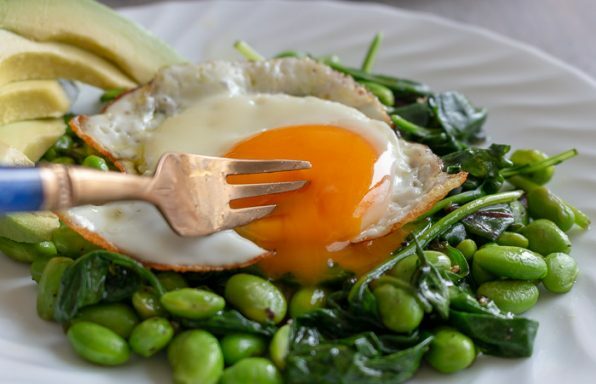 Kale's firm green texture is the perfect accompaniment to this salad.. You may substitute kale with any green you like such as rocket (arugula), spinach or romaine but these greens due tend to wilt faster. 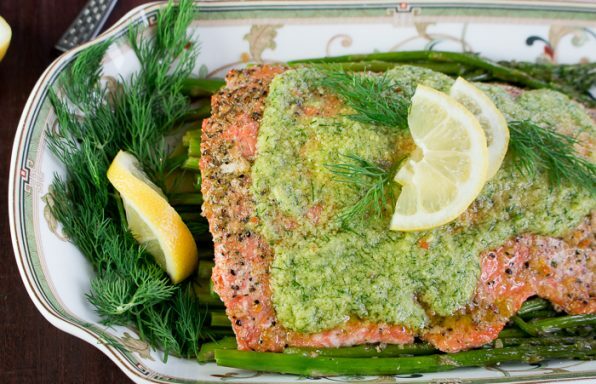 When you are hosting a outdoor party or bringing a dish to pass ,you want to be able to make it ahead and have it stay fresh. Kale can be tough so there is one important step you must do to make this salad perfectly tender and well seasoned. 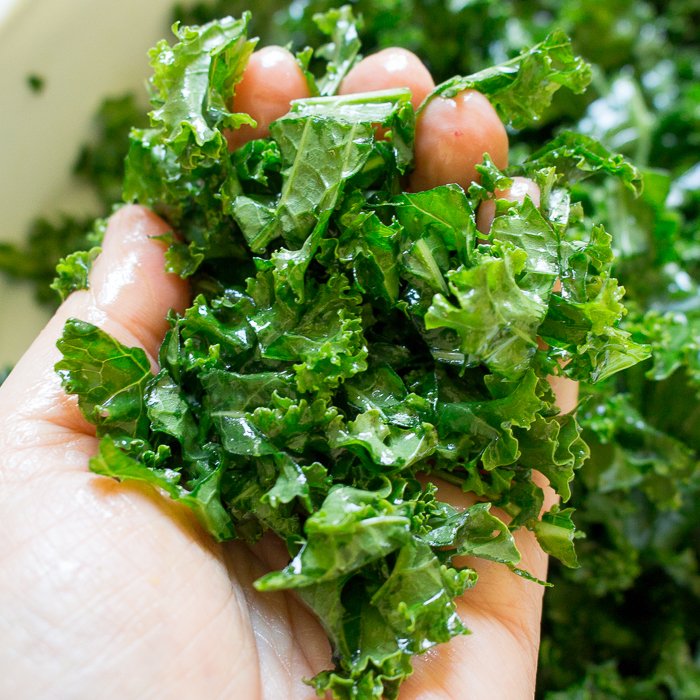 First drizzle your chopped kale with a drizzle of olive oil and then sprinkle with sea salt and with your bare hands massage your kale like you would a new-born baby with baby oil. You really need to get in there and massage it good. Spoons, forks and spatulas are worthless for this job. You must use your hands as it is the only way to soften and moisturize the kale. Your kale will go from a light green to a bright "kelly" green as the oils penetrate into the leaves. You are seasoning the kale too. Kale is one of those veggies you hear people adding to their smoothies. Have no fear you will not see a green smoothie on Healthy World Cuisine unless of course you would like us to make one. If you see a green smoothie like recipe on Healthy World Cuisine, it is most likely a Matcha Chocolate Chia Parfait. You see the family is not too keen on veggies in their smoothies. Did you know that Fresh Pineapple Juice contains an enzyme bromelain, which is a natural meat tenderizer and it can wilt the salad. If you want to make in advance, prepare your kale and chop your fruit and prepare your dressing separately and then toss everything together before your guests arrive. You can do this several hours in advance. We will let you in on a little secret. 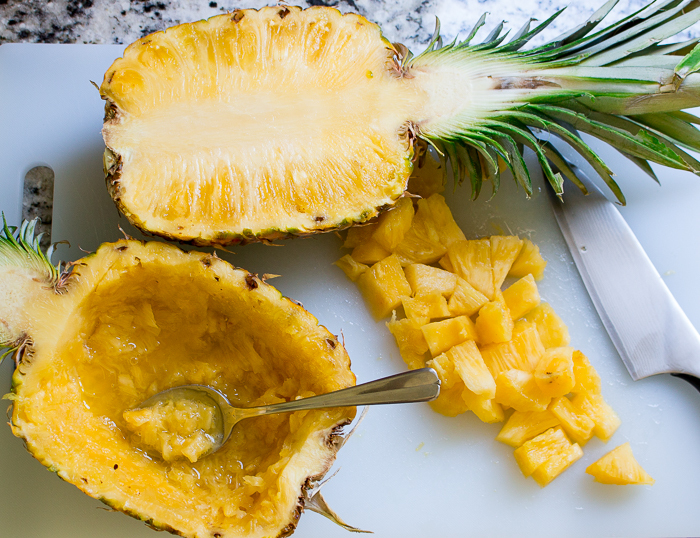 Our pineapple was so sweet and delicious that we did not even end up adding any honey to our salad dressing. We have kept the honey in the recipe as not everyones pineapple is this sweet. Please adjust the sweetness and tartness to your desired effect. You can put in any fruit you like in Tutti Fruitti Kale Salad and Citrus Honey Dressing such as Grapes, kiwi, papaya, mangoes all would go great in here. 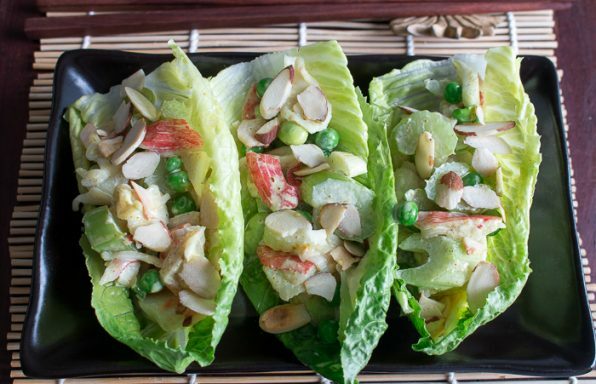 You could also add fruits such as apples, pears and other fruits that oxidize as you will be using a citrus dressing that will help stop the oxidizing process. 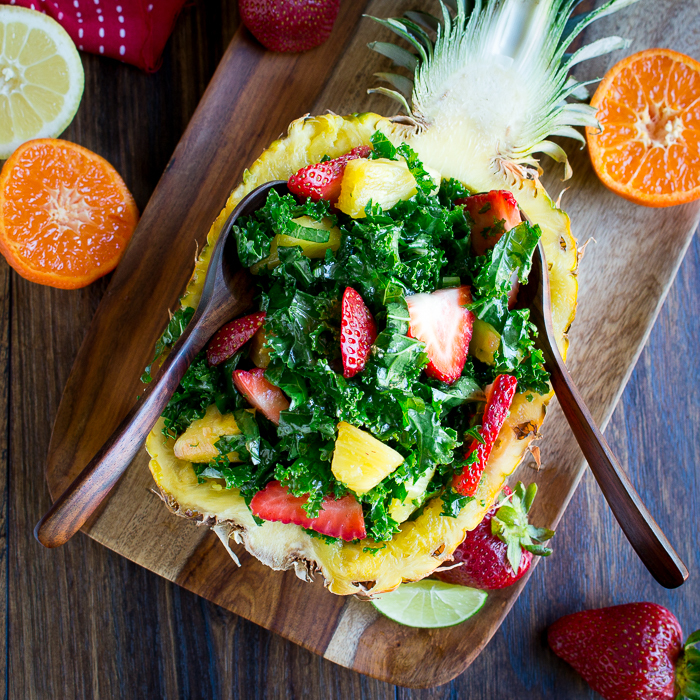 If you want to make this Tutti Fruitti Kale Salad and Citrus Honey Dressing lower carb or diabetic friendly, exchange the pineapple with another berry such as blueberries, raspberries or blackberries. 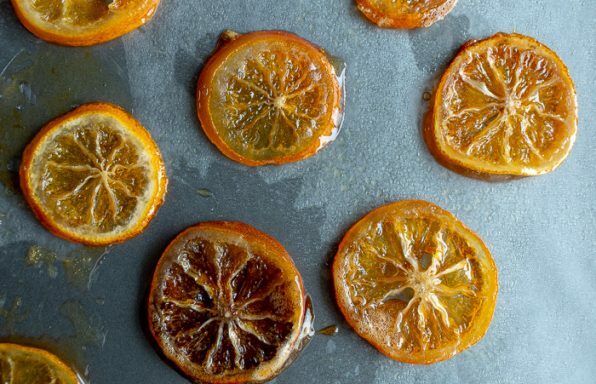 Exchange the honey with a sugar substitute and do not add the juice of the orange but instead add a little of the orange zest. 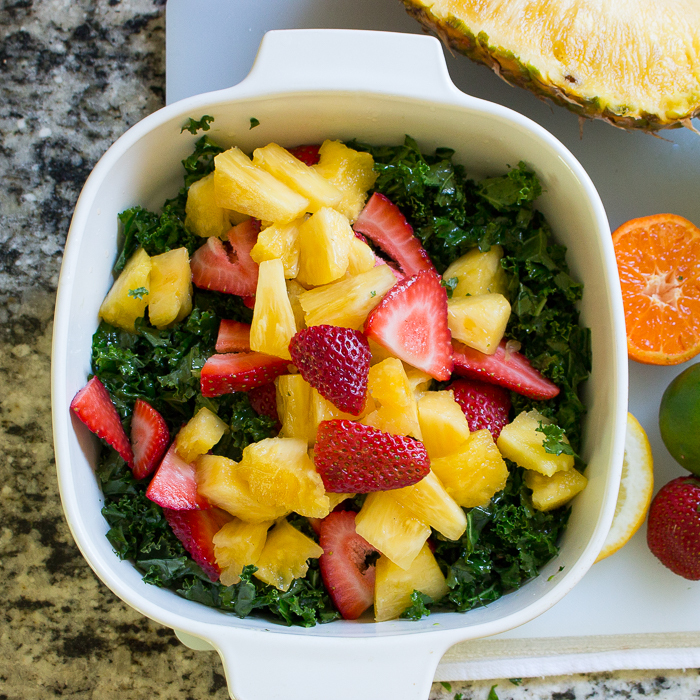 If you are looking for a dish to pass Tutti Fruitti Kale Salad and Citrus Honey Dressing is fast, delicious, colorful and healthy too. 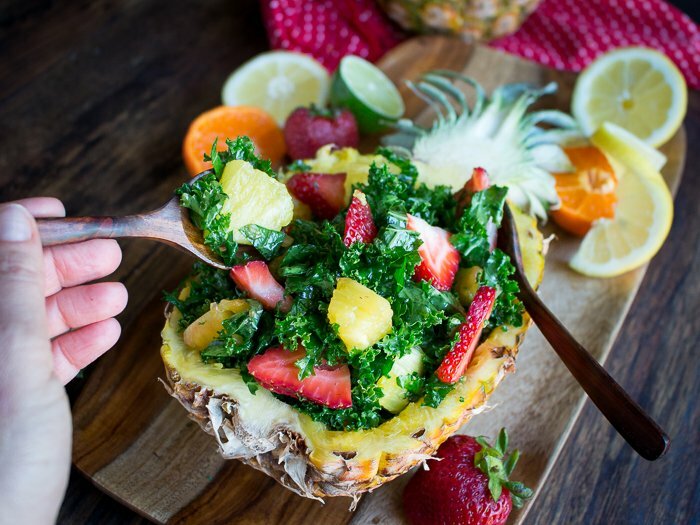 pineapple - 1 cup (peeled and diced) If diabetic exchange with a berry or just increase the amount of kale to berry ratio. 1Add your washed and chopped kale to a large bowl. Make sure to remove the stems and the stiff veins as well. Add the olive oil and salt to taste and massage your kale leaves for about 2- 3 minutes or until the leaves change from a light green to a bright kelly green in colour. 2Add your sliced strawberries and pineapple or fruit of choice. 3Add the juice of half of a lemon, half of a lime and half of orange juices and honey to the salad. Toss well. 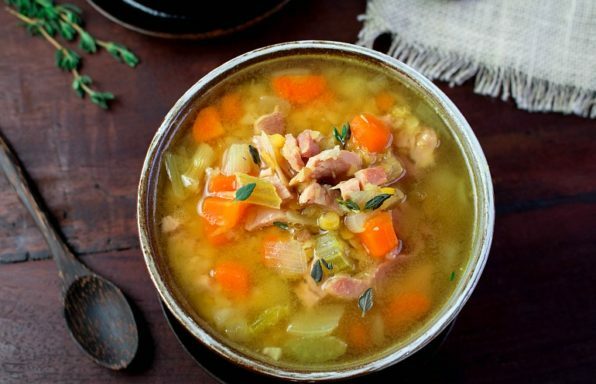 Taste and adjust seasoning. If you like it more salty add more salt. If you like it sweeter add more honey. 4Serve tutti fruitti kale salad with citrus honey dressing along the side of any delicious main dish or as a light lunch all on its own. 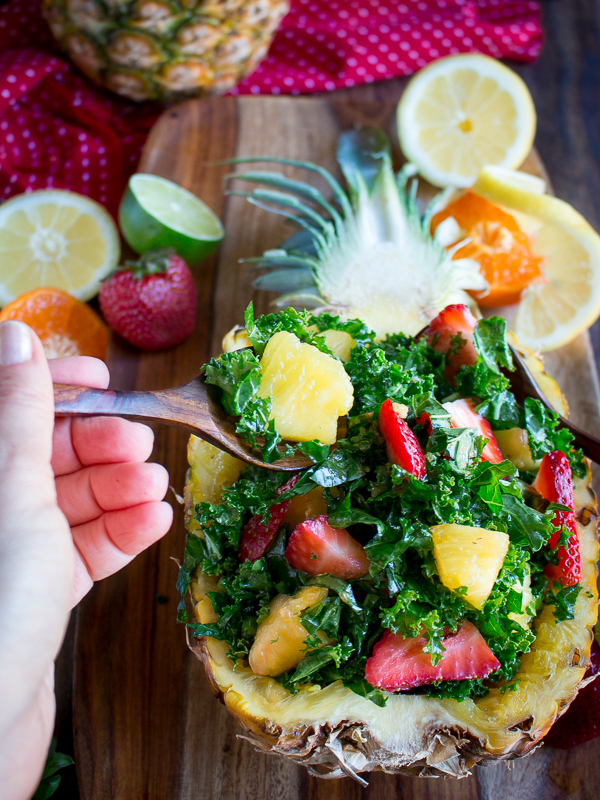 5If you want to make in advance, prepare your kale and chop your fruit and prepare your dressing separately and then toss everything together before your guests arrive.